Truck campers (TC) make a class of recreational vehicles designed to be carried in the bed of trucks. In more practical words, truck campers can be described as wheel-less/frame-less “inhabitable boxes” (RV shells) designed mostly for popular pick-up trucks. Thanks to the system of corner jacks (manual or power) they can be easily installed in the bed of the truck and similarly easily removed from it. In another contrast to all other RVs, they cannot be used on the campground as “stand-alone” units (like for example also designed for pickup trucks - Fifth Wheels) or any trailer as the matter of fact. The jacks are designed only for support (when in truck’s bed) and storage (when removed), but they cannot support camper’s full dynamic weight for off the truck living. Note that the TC’s box (unlike any other traditional rig) does not have self-supporting bottom frame that can sustain the load, it’s frame makes truck’s bed. In a way, the popularity of truck campers reflects rather the popularity of pickup-trucks that undoubtedly make important part of small family businesses. No wonder then, that the RV industry came up with practical solution for nature & vacations hungry army of pickup-truck owners. 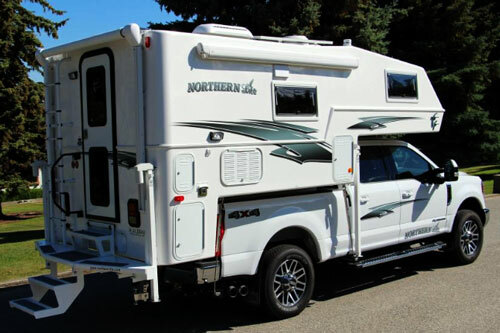 Out of two classes of RVs especially designed for pickup-trucks: fifth wheels and truck campers, the latter class (even in their luxurious versions) represent the “lower-end” (weight, space and cost-wise). 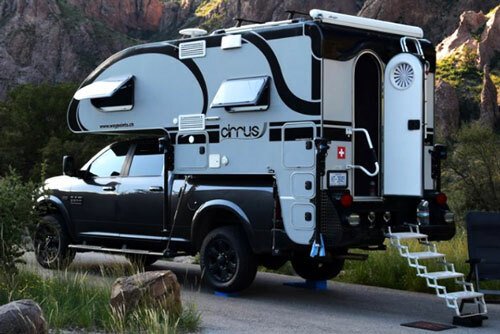 So, once you are on this page, we assume that in fact you own the pickup-truck and you are “almost convinced” that your next RV will be a truck camper. The only matter is which one. We are here to help you in this task. For understandable reasons, we will first shortly classify the series of most popular pickup-trucks. Obviously ((unless you want to buy a new truck), the truck camper must fit within the limits of bed’s length and cargo capacity of your existing pickup truck. Short-bed is by far the most popular size of pick-up truck bed (for this reason it is also often called “standard-bed”). Dimension-wise short beds are generally in the range from 5ft (1.5m) to 6.5ft (2m) long. The main advantage of such pickup-trucks is their load-hauling versatility, but at the same time easiness to drive and park. Long-bed usually represents commercial and farm pickup trucks. Their beds fit into the range of length from 7ft (2.1m) to 8ft (2.4m), the latter having advantage to haul typical construction materials (x by 8) with the tailgate closed. If the above classification was not already a bit “confusing” then this one specifying the load capacity certainly is. Popular classification like half-ton, ¾ ton and 1-ton pickup truck has only historical meaning as these numbers by no means represent the original cargo capacity. These days pickup-truck are rather classified based on their name and series they belong to like Ford F-150, 250, 350…. or GMC 1500, 2500, 3500…. They only very roughly follow the old classification of half-ton, ¾ ton and 1-ton pickup trucks. Bottom line is that based on vehicle’s User Manuel or information from the dealer you must calculate the maxim cargo capacity based on vehicle’s GVW (Dry weight), GVWR (maximum weight rating), RGAWR (maximum rating for rear axle(s)), weight of full fuel tank and of all passengers including the driver. On the other side of the equation, the cargo must include not only the dry weight of the Truck Camper but also all fluids (water-holding tank(s)) and extra supplies (food and “stuff” etc…). While theoretically, the pickup truck should be originally equipped with tires and braking system rated for its maximum GVWR rating, in practice it may not be the case (especially if the original tires were already replaced, are used (in poor shape) or not rated for off-road environment. Note, that tires and brakes are frequently main factors determining the safety of RV-ing. It is the most traditional class of TCs. They are either made as molded fiberglass shells (horizontally-joined clamshell-construction), all-aluminum frames with aluminum or fiberglass-finished siding, and more rarely as metal/wooden structures with laminated walls. Pros: The main advantage of hard-side TCs is their robustness (and hence higher reliability), good thermal (and sound) insulation and most likely lower cost for comparable constructions due to their popularity. Usually they also offer more interior storage space due to availability of the full height of the camper). Also, they usually come in more “luxurious” configurations although let’s face it – due to limited length, they will always lack the “residential feel” as for this you need an open space! Cons: Higher aerodynamic drag when on the highway (so poorer fuel efficiency). Higher center of gravity (what may be especially risky in off-road environment). These low-profile truck campers are especially designed to improve truck’s handling on highways (better aerodynamic profile) and in no-road environment (better stability due to lower center of gravity). Usually, the solid roof of the pop-up TC can be raised/lowered increasing the interior headroom by about 1/3 when in camping configuration and correspondingly lowering for road. The exposed side-walls (typically with ventilation windows) may have one of two different structures: solid or soft. Overwhelming majority of pop-up truck campers come with soft upper walls (canvas-based). Mostly only those designed for 4-season RVing, due to the need of better insulation, are designed with hard upper walls. The pop-up track campers (regardless the version) are usually more spartan models than their solid-walls counterparts. But they nicely meet many requirements of nature lovers attracted by wilderness. Pros: Lower aerodynamic profile on the road and better stability of the pickup truck/TC in off road environment (includes ability to drive in wooded areas with low branches). Units with soft-upper walls have also lower weight what makes them ideal candidates for smaller pickup-trucks. Cons: Lower reliability (combined effect of wear & tear for canvas and more complex mechanism of moving parts). Poorer weather resistance (canvas-based walls are prone to mold) and obviously lack of thermal and sound insulation barrier. The latter may be a benefit in wilderness but nightmare when on the busy campground. Due to limited interior volume in road configuration (by about 1/3), they usually are more modestly equipped and may lack some otherwise needed features. Due to technical challenges, slide-out modules are relatively new addition in truck campers (they came in late 90’s). 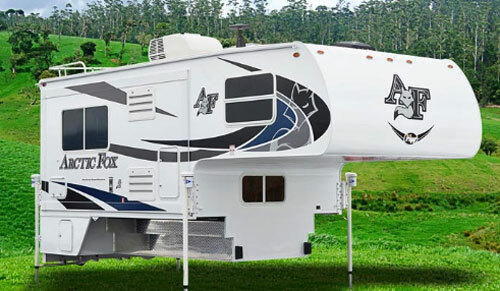 Needless to say however, that these days due to multiple slide-out modules (you will find on the market models with up to 3 slide-outs), truck campers can offer much sought residential ambiance (living space with entertainment center, lounge with sofa etc…) as well as bath with toilet and shower. 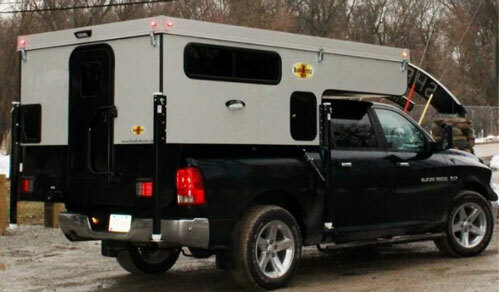 Note that slide-out units are available only in hard-wall truck campers with full frame structure (so-far not possible in pop-up TCs and frame-less molded-fiberglass models). Pros: Truck campers with slide-out modules offer much more comfortable RV-ing conditions (space, ambiance, more features..). Cons: Significantly higher price and weight (for many important barriers). More complex structure (many moving elements) will lead to lower durability). Usually they require heavy-duty long-bed pickup trucks w/dual rear wheels for hauling. Due to extra weight and higher center of gravity, TCs w/ slide-out modules are not the best for off-road adventures. While baths are relatively new additions in our homes (compared to millennia of human civilizations), today they are indisputably considered as a must in any home, including the one “away-from-home”. It will be also difficult to convince any RV-er (especially boondocking) that the Mother Nature with solve all problems. So, what options you will find in truck campers? 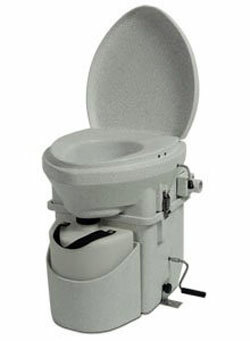 Dry baths (separate shower cabin, toilet, sink, medicine cabinet etc) are available in high-end TC models with slide-outs. Wet baths (cabin combining shower with toilet but usually w/o sink) are more widely available even in traditional truck campers. Both solutions provide some level of comfort and privacy but take substantial space and add extra weight (plumbing, black tank etc…) as well as cost. However, if this is a non-negotiable feature, then opting for the wet-bath will be a good compromise as it usually takes less space and adds less weight compared to bath’s dry-versions. Other Solutions: For those happy with an exterior shower (or even better – portable “solar shower”) this may be the best option without adding extra weight and “stealing” interior space. 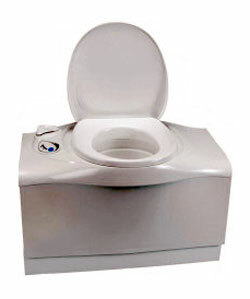 The problem of toilet can then be solved by using a cassette-toilet (portable waste tank has to be periodically dumped into sewer system), or more and more popular concept of composting toilet (does not need any flush water and its waste tanks can be dumped into the nature once the composting process is finished). Are Truck Campers for You? These days truck campers can offer most of amenities that in the past were reserved only for larger RVs (historically, truck campers were designed as sort of poor-guy, easy to move “cabins” mostly for solitary fishing and hunting weekend trips). 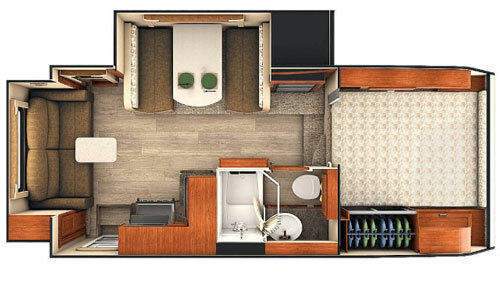 Well, these times are long gone and now TCs offer not only comfortable sleeping area but also galley w/ stove, fridge, microwave and cabinetry, holding tanks, propane heater, dining and living space and quite often bath. With traditional frontal cabover (sleeping place) and rear overhang section (as well as slide-out module(s) in some TCs), modern-day truck campers made the long way from their original and let’s face it – very modest ancestors from 50’s-60’s. Given the fact that pick-up tracks by definition have ability to drive off-beaten roads, many truck campers are also designed for off-road environment (strengthened, corrosion & rot free structure etc…). However, to make it clear – in general, the pickup-trucks loaded with TCs are not the best suited for extreme off-road conditions (specialized pull-behind trailers will do much better). 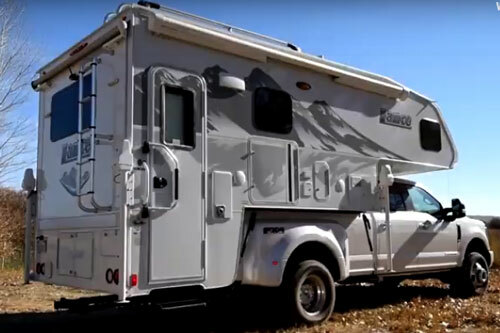 The bottom line is – TCs are perfect solution for owners of pickup trucks that for limited time want to leave behind their residence (with all its ambiance) and spend time in nature more like old time backpackers and tent campers. In such case the off-the ground truck camper provides enough of comfort and security (much more than a roof-top tent), is affordable (especially if you already own the pickup-truck), provides weather protection, high level of mobility (including no-roads environment) and some level of energy and water autonomy needed for boondocking. If this is your case, look for traditional truck campers (no bells and whistles), just what you need, (pop-up roof version may be better for out into the Mother Nature trips). While modern-day truck campers can sleep even 5-6 people, in reality they offer the best RV-ing experience for just two persons (eventually 2+kids).